Former US president Barack Obama offered his successor accolades and advice in a private letter that underscored some of his concerns before he left office in January. It is customary for presidents to leave notes for their successors. But typically these missives do not come to light so quickly. The hand-off letters from George W. Bush in 2009 and Bill Clinton in 2001 were revealed earlier this year. CNN reports it received the Obama letter from “someone Trump showed it to”. After taking office, Mr Trump praised the note from Mr Obama, calling it a “beautiful letter” in an interview with ABC. Mr Trump added that he called Mr Obama to thank him for the note. The White House declined to comment, as did a spokesman for Mr Obama. 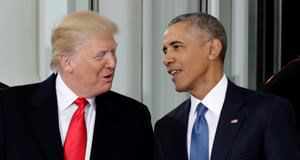 In the letter, Mr Obama offered some advice: urging Trump to provide opportunities for those “willing to work hard”, arguing that American “leadership in this world really is indispensable” and asking him to leave “instruments of our democracy at least as strong as we found them”. Mr Obama also wrote that Mr Trump should “take time, in the rush of events and responsibilities, for friends and family. They’ll get you through the inevitable rough patches”. He concluded by wishing the “very best as you embark on this great adventure”.